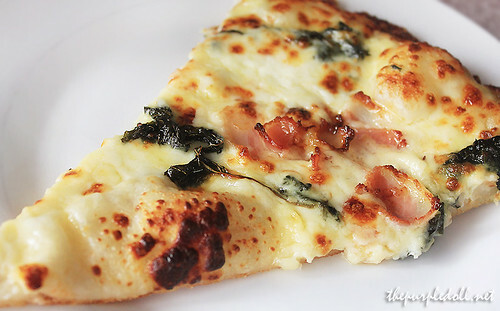 After having a taste of Pizza Hut's Tuscani Supremo, as well as the Roast Beef flavor, I finally got to try the third most raved pizza in the Tuscani line -- 3-Cheese Bacon & Spinach (P519). This pizza is simple yet really good. 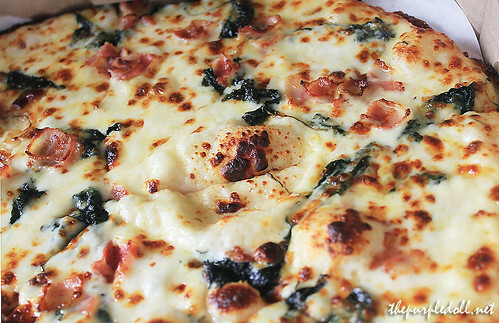 With only spinach, bacon with bechamel sauce, and 3 cheeses -- parmesan, cheddar and mozzarella, it left me very satisfied. I actually finished 3 slices which is quite a lot considering we ordered it in a 14-inch Super Family size. Probably not everyone will like this pizza flavor as much as I do. But if you're a cheese lover, you should give this a try. As for non-veggie eaters, don't worry 'cause the spinach doesn't taste very vegetable-y at all. Now, only 3 more Tuscani flavors left -- the new 4-Cheese Lasagna, Premium All Meat, and Gourmet BBQ Chicken, and I can proudly say that I've tasted them all! How about you, what's your favorite pizza flavor? Have you tried Pizza Hut's Tuscani line already? i love cheese. dami pala tuscani flavors. I love cheese pizza! Maybe I'll drop by Pizza Hut sometime this week. Cheese and spinach? Sounds great! Nice photo. my mouth watered! lol! Talking about pizzas, I missed pizza while I was in my 2 week vacay. So yesterday, I went to Sbarro to get my favorite slice of Chicago white. Yum! I've always preferred Pizza Hut too whenever I want my pizza fix. But I haven't tasted any from their Tuscani line yet. Hmmm, maybe one of these days. To hell with diet plans! Haha. I've always been a fan of their stuffed crust pizzas but this really looks good. Will try it soon. Wow, I have one more food blog to check out, and it’s your blog. I love your site and I bookmarked it already. I seriously need to catch up on your posts! haven't tird the 3 cheese bacon and spinach! Looks delish mahilig pa namn ako sa bacon! I have to try that one. my son, gabby would surely like this! he's so into pizza hut here! Had pizza last night but would love to try this. spinach and cheese reminds me quiche, and I love that. Thanks for sharing Sumi! Lovely photos! too bad I just got a Shakey's card. haha! yummmmmmmy! parang kaharap ko lang ang pizza...ehehehe...fave ko naman yung hawaiian flavor! I so love your pictures! And I always love Pizza Hut!